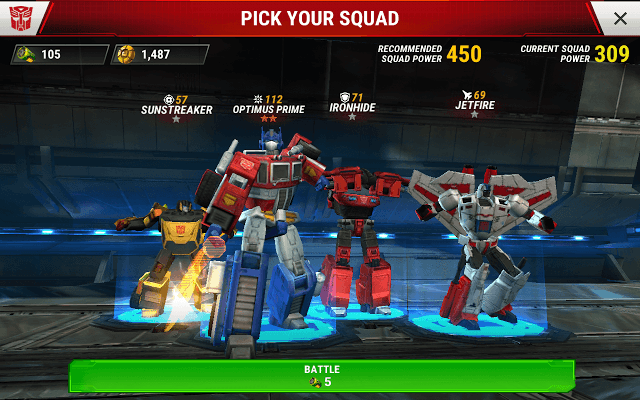 Transformers: Earth Wars can be criticized for being a Clash of Clans clone, but that does not take away anything from its simple yet addicting gameplay. Thanks to CoC, base building strategy is now a genre of its own, and almost every real-time strategy title offers similar gameplay mechanics. When you arrive at your opponent’s base, take your time examining it before deploying your squad. The battle timer won’t start until a robot is dropped on the green landing zone, so you have ample time to examine your opponent’s base and discover loopholes in it. 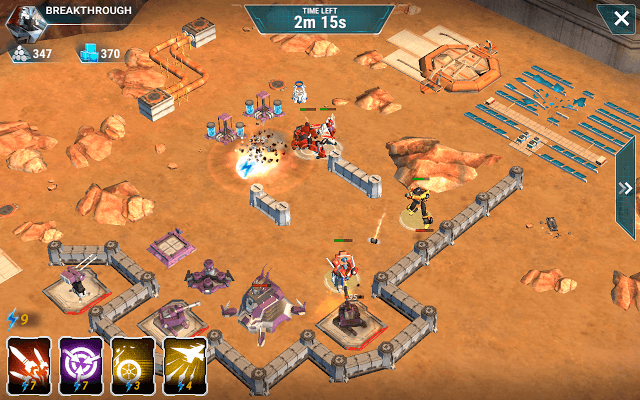 Don’t forget to tap each enemy turret, mortar and other defenses to know their range. This will help you come up with a better attack plan and deploy your squad close to weaker areas of the enemy base. Attacking the HQ straight away can be suicidal because groups of turrets and other defenses will usually be placed around it. Look for areas crammed with non-defensive structures guarded by fewer defenses. If you find one, then deploy them on a spot parallel to that area. Do remember that each destroyed structure gives energy, which can be used to summon special abilities. Destroying areas that have fewer defensive structures will allow you to collect more energy, which can later be spent on key abilities that can be used against a group of auto cannons and a mortar. Tap your leader and armored frontline fighters to drop them first, followed by flyers and strikers who usually attack from a distance. Use abilities at the right moment, don’t use them straight away. Save the best abilities to destroy powerful defenses. In case there’s a mortar placed somewhere on the base, target it immediately if all your robots come under its attacking range. Usually mortars are placed far away from the landing zone, closer to the enemy HQ. They may also be protected by walls. You can use Optimus Prime’s Inspiring Charge to rally autobots and target mortar. The mortar fires high-explosive missiles at long range, but can’t fire at robots if they are too close to it. You may also want to use warrior class robots’ Rush In ability to rush into a mortar. When the mortar comes under its range, tap Rush In and then tap the mortar. The robot will turn into a vehicle, smashing any walls that come between him and his target, and then start attacking the mortar as soon as it reaches close to it. Noticed the landing zone in your base? Well it does not encircle your base fully. What you can do is protect your base by building walls parallel to the landing zone so that at least the front part of your base that’s parallel to the landing zone is protected. The enemy will usually choose any spot on the green landing zone to deploy his units so just make sure you have got the area between the landing zone and your base protected by walls. You can also add an extra defensive layer inside the outer walls to protect your HQ and long range defenses like the mortar. A Warrior class character is an armored frontline fighter. It should be deployed first, along with Special Class or Leader characters. Warrior class characters have high health and can be quite useful against mortars and other long-range defenses. Can be used to inflict damage to buildings from medium range. Try to deploy them after deploying warrior characters so that flyers can support them. When on ground, they have a better attack range than warriors. An Air class character’s ability, Air Strike, fires 4 powerful missiles at a target building. Use this ability to destroy auto cannons and mortar. Since it can shoot over walls and has a long range, the gunner can be used to destroy defenses lined up close to walls. Use a gunner class to target such defensive structures to weaken opponent’s defenses. Try to deploy the gunner first to destroy turrets placed closed to walls. Once it has cleared the frontline defenses, deploy warriors to take down the next line of defenses. Next, use its Incendiary Barrage on a group of turrets placed close to each other. This ability will let you shoot rockets that will set a large area on fire, and the flames will keep damaging a group of turrets. Alternatively, gunners can be deployed last so that they can provide support to Warrior class characters. However, gunners are weaker than flyers and warriors. Try to you use up his abilities on a cluster of turrets as soon as possible. Special class characters have a secret ability which can be discovered once you have unlocked them. They are also known as leader characters and have high health than others. Once you have unlocked a special class character, go to its profile to check it ability and stats. Can be used to heal characters. Try to deploy him along with a group of characters and use his healing ability on partially injured characters. A Warrior’s Rush In ability can be quite useful against long range defensive structures like Mortar and Auto Cannons. Tap a warrior’s ability and then tap on a long-range ground unit to make him rush into his target smashing any walls that come in between him and his target. A Gunner’s Incendiary Barrage should be used against groups of defensive structures placed close to each other. The Gunner’s AoE ability will shoot out rockets that will set a large area on fire dealing damage over time. Flyers’ Air Strike abilities can be used against Auto Cannons and mortar, but try not to use it against Laser Turrets and Missile Launchers as they attack airborne units. Laser turrets usually have a shorter range and can be easily destroyed by Warriors. As you keep Leveling up your HQ, you will not only unlock new buildings, but also unlock extra buildings of the same type. You can easily check what buildings will be unlocked post-upgrade by tapping your HQ. 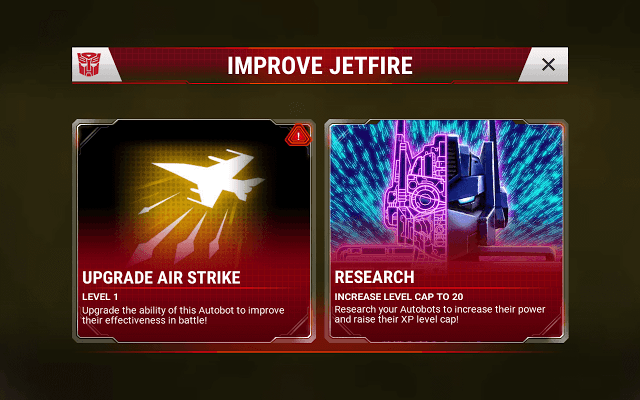 If an HQ upgrade unlocks extra Energon and alloy harvesters, level it up and build those harvesters right away. Having more harvesters will boost production. Losing a PvP match can be heart-breaking. Medals are deducted from your total medal count and you get fewer resources. The only silver lining is the opponent’s base design. You can get design ideas from the winner’s base layout. 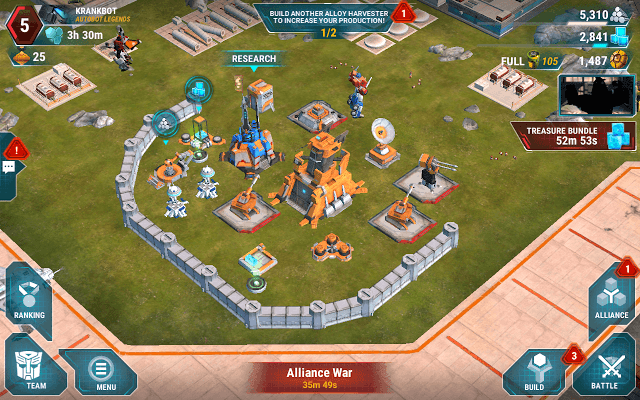 You may even take a screenshot of your opponent’s base design at the start of play and build your base similar to that. Don’t try to build a base exactly like your rival player’s base. Try to be original and creative. The research lab can be used to level-up a character’s special ability as well as increase his level cap. To upgrade a character’s ability, you will need Spark. The free crystal that you get every 8 hours may contain spark. To get more spark, you will need to fight Alliance Wars and win a league. After winning a battle, your character gains XP and once the XP bar is full, it levels up. Leveling up a character increases his power. Once a character reaches max level, it’s time to increase his level cap by upgrading him via the research lab. Upgrading a character will improve his health and damage considerably and raise the max level by 10. Once upgraded, your character can again start gaining XP and level up to increase power. You will need 450 cyber coins to get one premium crystal. Chances of getting 2-star characters using premium crystals are more. Cyber coins can be earned by completing achievements. You can see a pending achievement at the top the game screen. Save cyber coins for crystals. Do not use them to speed up constructions/upgrade. The game lets you speed up construction/upgrade when a building timer reaches lower than 5:00. Free Crystal: A Free Crystal may contain boost, spark or a 1-3 star character. You can claim a new free crystal in every 8 hours. 2-Star Crystals: Gives guaranteed 2-star characters. You will need 2-star shards to get one 2 star crystal. You can earn shards by reaching a new “Player Rank”. To reach a new player rank, you will need rank points. Earn rank points by constructing/upgrading buildings and by researching characters at the Research Lab. 3-Star Crystals: Guaranteed 3-star characters. You will need 2000 3-star shards to get a 3-star crystal. 4-Star Crystals: Guaranteed 4-star characters. You will need 2500 4-star shards to get a 4-star crystal. You can also spend Loyalty points on special crystals. To gain loyalty points, win Alliance wars. Join an alliance and then go to your Alliance HQ to battle enemy alliances and win prizes. You can also spend Loyalty points on special crystals. To gain loyalty points, win Alliance wars. Join an alliance and then go to your Alliance HQ to battle enemy alliances and win prizes.